Case Study on the Effects of DHAA Serum on Toenail Fungus. 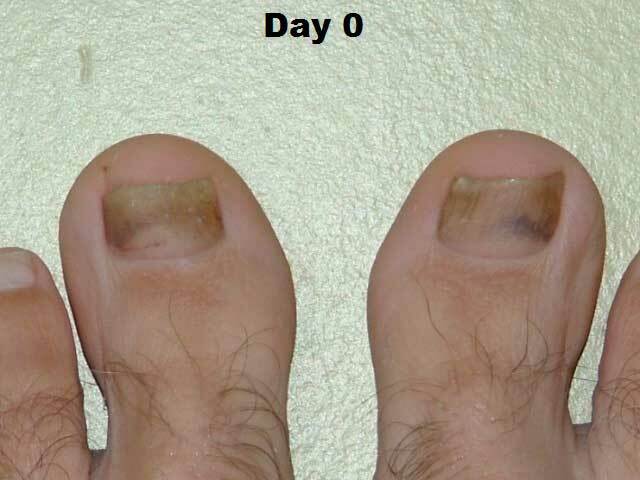 A visitor to the ReCverin website submitted the following letter and photos regarding ReCverin 50/50 DHAA Vitamin C serum used to treat toenail fungus. They have made it available to us to keep all DHAA case studies in one place. The ReCverin product is a 50/50 DHAA (Dehydroascorbic Acid) and Vitamin C serum similar to the one manufactured by us. As we do not ship to the USA we highly recommend this product to US customers wanting a top quality DHAA Vitamin C serum. Dear Sirs: I'm impressed by the various reports and case studies about DHAA on your website. 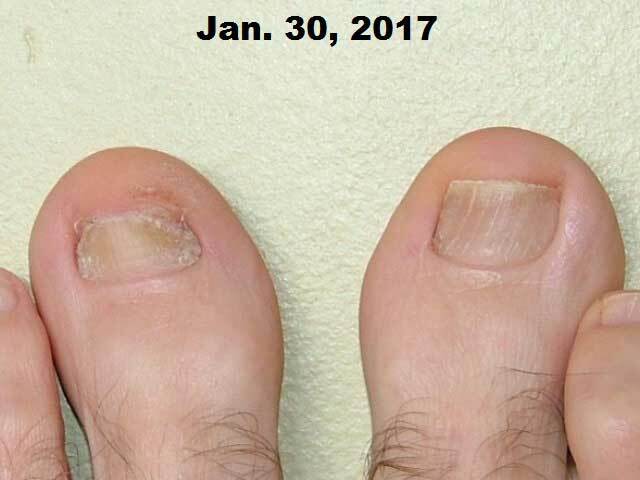 I have documentation of my experience with a DHAA serum on toenail fungus, and you are welcome to post this on your site. I've been a user of vitamin C for years, and I've experimented with it for just about every condition that has ever afflicted me, with varying degrees of success. My big toenails on both feet have been thick, yellow, and ugly for at least twenty years. I believe this is due to infection with fungus, but I've never had it examined by a doctor or had lab tests to confirm this. I've never suffered any pain from this, or noticed any unusual foot odor or problems other than the obvious unsightly appearance. But you can probably guess that at one time many years ago I experimented with using a strong solution of ascorbic acid on my nails. This I did daily for months, but the results weren't remarkable. (I once had photos of this experiment, but I guess I've lost them). When I became aware of the availability of a serum containing DHAA, I did a lot of reading about this form of vitamin C.
I became curious if it might have a different effect on my toenails, so I got some and began this experiment. Day 0 (August 11, 2011): The appearance of my toes before beginning. Note that the very dark purple area under the right toenail, and the thin red, line-like mark under the left toenail, are bruises caused by jamming my toes against the front of a too-small pair of athletic shoes during sports activities many weeks ago. My nails were both considerably longer then; the little dot near the very front of my left toe is the indent where the corner of the toenail was then. Other than the bruises, the appearance in this photo is typical of what my toenails have looked like for about 20 years. The yellow color involves the parts of my nails mostly towards the front and sides of each, whereas the parts in the middle near the cuticles don't appear to be involved. I intend to wash my feet each day when I shower or bathe, and after they're dry to apply 2 or 3 drops of DHAA serum to each toenail. I'll rub it into the skin adjacent to the nail, down into the grooves between the skin and nail, and along the front edge so that it can get under the nail. Day 7: Well this isn't what I expected. After seven days of applying it daily, my nails are staining darker yellow. So much for improving the appearance! But this is much different than when I previously applied ascorbic acid…I don't recall any color changes when using regular vitamin C.
It's interesting that it appears the darkest staining is in the areas where the infection is worse, and that the skin around the nails isn't stained (except, curiously, the little dot on the left toe). Maybe the infected parts are more permeable? Maybe DHAA is interacting with fungus? Day 13: I've still been applying DHAA serum daily. But today I vigorously scrubbed the nails with a washcloth and soap before taking this photo. The color is definitely deep in the nail in the most-infected areas, but is superficial and can be washed off in the unaffected areas near the cuticle. Day 22: After 3 weeks of daily applications, I have discovered something REMARKABLE. A large portion of each nail has completely detached from the nail bed!To demonstrate the depth of the nail separation, I placed a piece of transparent tape on my left toe, and then I used tweezers with one side inserted under the nail as a gauge to mark the distance on the tape. .As I previously mentioned, I have never noticed any excessive foot odor, but the crumbly material that I scraped out from under the nails? PEE-YEW, it was like stinky socks to the power of ten! I intend to clean under the nails each day by scraping in addition to washing with soap and water, and to continue the daily application of DHAA serum. Day 23: I was able to scrape a little more stinky debris out from under the nails today. I decided to mark the nails so I could gauge their growth, so I filed a line near the cuticle on each and then applied a dab of black enamel paint. Day 24 (No photo): I've scraped under the nails for the last two days, but today I no longer am getting any odiferous debris from under them. I won't do this daily any longer, but I have begun using a toothbrush to help reach deeper under the nails to clean them with soap and water. 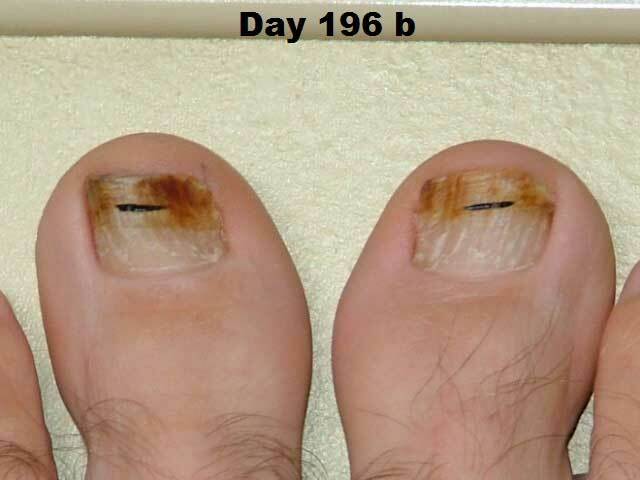 Day 105 (No photo): The emerging new portion of nail near the cuticles has not developed the deep amber staining, and appears to be normal thickness and otherwise free from infection.Today I will discontinue applying DHAA serum daily, but I may apply it occasionally as it seems like a useful marker of the infected area of the nail. Also I will continue to wash daily under the nail with soap and water using the toothbrush. Day 196 Photo A: As the nails continue to grow, the area of nail that is attached to the nail bed has extended, particularly near the lateral margins of each nail, as can be seen in photo above. I've been applying DHAA serum for the past few days. 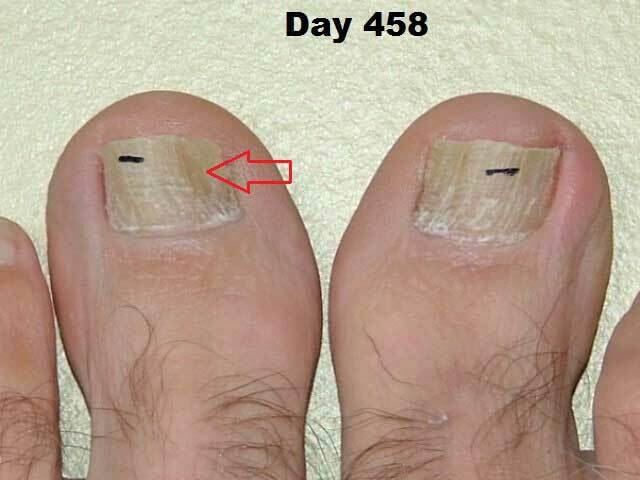 On the right toenail, the black growth marker seems also to delimit where staining stops. But the left toenail has staining quite a bit further towards the cuticle, and I think it might indicate that the left toenail has become re-infected. For the purpose of this experiment it has been interesting to see the progression of the stained areas. However, in hindsight, I think for the purpose of actually getting rid of the infection it would have been better to have completely trimmed off all portions of the nail that had become detached from the nail bed on Day 21. For months there has been a large area underneath these detached portions that has been difficult to clean and keep dry, so it seems a great place for fungus to re-establish. I've found that if, every few weeks, I soften the nails by soaking (e.g. taking a bath) and then bend the corners upwards with tweezers while pushing the surrounding skin down, this prevents and alleviates the ingrown toenails. But when I let one go too long, such that it got inflamed, this process itself was very painful. (“Ingrown toenails,” by the way, is the number-one listed side effect of every toenail fungus treatment that I've read about). And finally, these darkly-stained areas aren't very attractive anyway…I suspect that “missing” nail looks better! So, as I said, I think that removing it all initially would probably have been best, and also that keeping the nails trimmed close to the part that is attached to the nailbed would also have been desirable. 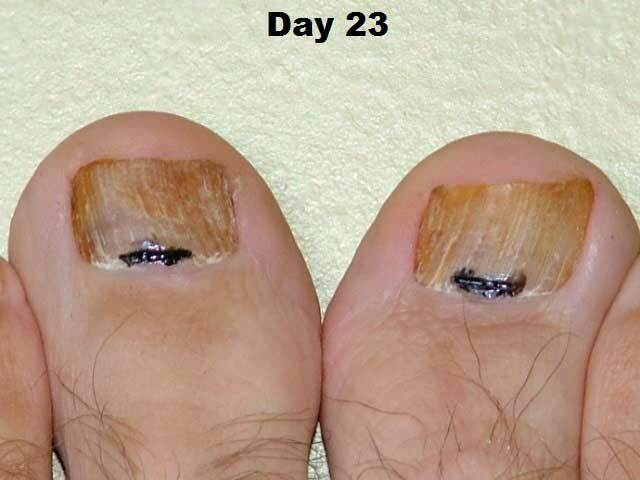 It may also have been desirable to apply a topical antifungal like Lamisil on the exposed nailbed during the regrowth phase. Day 458: It's been 9 months since the prior photo, the black growth markers in that prior photo have long since grown out and been trimmed off. The markers in this photo were painted on near the cuticle about 6 months ago. My nails grow a little more than a millimeter per month, which I've read is a typical growth rate. I haven't applied any DHAA serum during this time. The color and appearance of both nails is improved (in my opinion) as compared to Day 0. I wouldn't call them beautiful by any means; the striations aren't pretty (actually all of my nails have striations, although these are more extreme). On the other hand, I haven't done any kind of “pedicuring,” and I think they would be nicer looking if, for example, I was to file the top surfaces so they were smooth. The left nail has a small area that is a little more yellow than the rest, and I suspect it might still have some fungal infection as I suspected earlier. Dec. 11, 2016: It has been nearly 4 years since the previous photo. The right nail has continued to improve with no signs of having become re-infected. The striations on the surface are less pronounced, and the portion of the toenail that is attached to the nailbed has extended forward to what I think is about normal. The left nail continued to show increasing color and signs of being infected over this 4 year period, so I decided to again treat it with DHAA serum. I began daily applications 11 days ago, and intend to do so for a total of 21 days. Then I intend to trim completely away any of the toenail that has become detached from the nailbed. 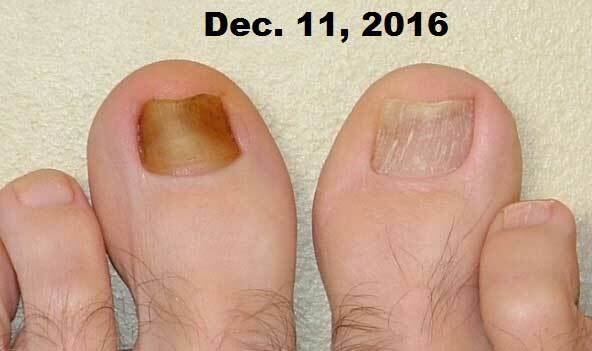 Dec. 20, 2016: I've applied DHAA serum daily for 21 days to the left nail. Today I trimmed away the entire portion of the nail that had become detached by the use of the serum. I also used a nail file to clean and smooth the top and edges of the nail. I lightly filed the top surface of the right toenail as well, just to improve its appearance. 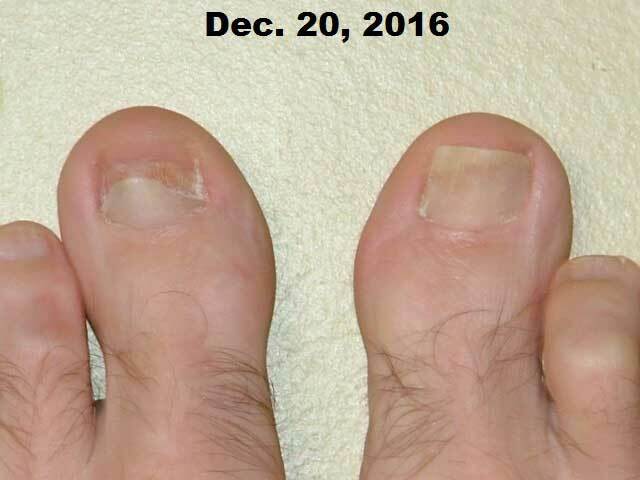 Jan. 30, 2017: The left toenail has been growing for 40 days since it was trimmed, and seems to doing nicely. I intend to keep this nail trimmed such that the nail doesn't extend beyond the portion that is attached to the nailbed. I trimmed the right nail today to the length I have been maintaining it for a long time. At this length, there is only a very small portion along the front edge that is not attached to the nailbed. If you decide to post this on your website, I'll try to follow-up with additional photos of the progress of this latest experiment.